Just look at those knees, an older man proclaimed the other day at the barbershop as we waited for the guys’ semi-annual shearing. You can tell he’s active, he nodded approvingly. Those are a boy’s knees. Active? You can no more stop Big Guy from rushing headlong into life than you can stop the wind. If he’s not crashing on his bike, he’s sailing off his scooter. Or he’s running downhill on the sidewalk at a speed that just won’t let him stop quickly unless he lands on his knees. 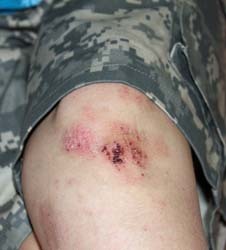 The result is a constant patchwork of scrapes, scratches and gouges. One no sooner heals than a new one forms to replace it. It’s not because Big Guy’s a klutz like his mom. It’s because he knows only one speed: Overdrive. He’s been that way since he learned to walk at 10 months. His chubby belly would get ahead of his wobbly legs, and he’d topple over. “Be careful!” his dad would warn after every fall. He did it so often that Big Guy learned to fall, giggle, then look at his dad and chirp “Careful!” I’m not sure if he thought that was what you say after you fall or if it was the first sign of the joker to come. Used to be a layer of jeans that lasted only a little longer than a Kleenex offered some protection. No matter how cold it is now, though, Big Guy prefers shorts. It’s great for the budget because I’m not replacing clothing once a month. It’s not so great for his legs. We have the routine down now. Big Guy tumbles, whimpers a little and runs into the house. I clean him up with peroxide and apply “magic” Bactine. I really need to start buying that stuff by the gallon. Sometimes, if it’s more of a gash than a scrape, I’ll add Neosporin and a Band-Aid later. A camouflage one, which I suppose is supposed to be more manly. Sometimes even that doesn’t help if he crashes again on a recent cut. “Oh, those knees!” the tech moaned when he went to get his allergy shot recently. They looked so bad that she broke out the Neosporin and bandages on the spot. “You need to be more careful!” she admonished. Honestly, I wouldn’t have it any other way. He’s an adrenaline junky who’s going to find some way to get his high. I’d rather it be through scraped knees than via something truly stupid.